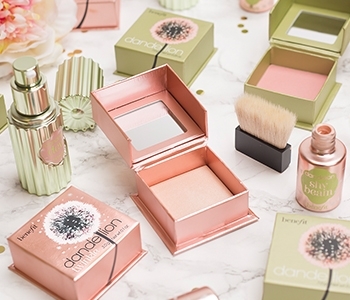 Benefit’s Dandelion makeup collection is all about creating a lit-from-within glow with its radiance enhancing collection of highlighting essentials. By sweeping away dull tones in your skin and replacing them with the glow-boosting powers of sheer pinks, Dandelion was born to make your skin shine for all the right reasons. The perfect pick-me-up for all complexions, create your perfect luminosity with the Dandelion collection from Benefit.